I don't get it-who or what is accused? fun shot. great execution. should have used a pea instead of an unidentifiable little thingie though. too bad I can't figure out what I am looking at, besides the fork of course. What? I dont get it. what is that little thing behind the fork? I like the photo and the shadowing is great. 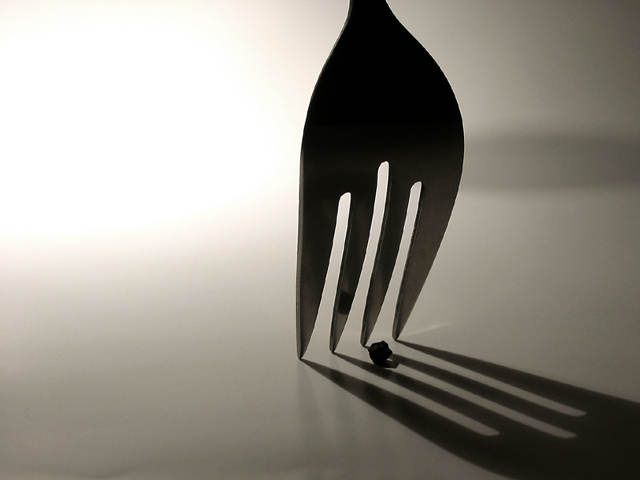 whats that thing distrubing the shadow of the fork?!? Why's that there, I don't really want to know I'm just ranting cause to me it ruins the photo. Pretty nifty. I love how crisp it feels. Very nice use of light and shadow! Excellent. Dunno what the squiggle is - and may have prefered it without, but the shadow is fantastically sharp and the composition very well thought out. Very cool idea. Great range through your grays. Composition is very nice. (I might have moved the fork over to the right a bit more, but that would have meant problems with the shadow -- might have been fixed with a different light position, dunno.) My biggest question is what the object next to the fork actualy is. Maybe it doesn't matter to the shot, but I wonder if a more recognizable "thing" wouldn't have been better. strong composition and shadow play. find the peppercorn? a titch distracting tho'. good work! Very good use of shadow. Good thought went into this. You captured just what you wanted I feel. Nice idea, the shadow works great, as does the cropping job. Composition is nice. Light on left seems a little harsh. Nice work though. Proudly hosted by Sargasso Networks. Current Server Time: 04/18/2019 09:21:24 AM EDT.